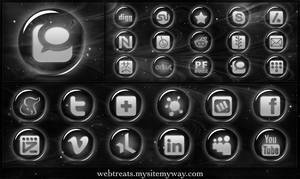 My second set of social media icons is a button set. A little different than the glossy orb feel, and also 5 more buttons/icons per set (25). Currently only available in white, red, and black but more colors on their way soon (under dev). Please feel free to use these in anyway, just do me the favor of subscribing to my YouTube channel [link] . Fanning me on Facebook [link] . Or just visit my blog [link] . **UPDATED 2/16/10** The set is now at 29 icons and includes the newly created Reddit icon. 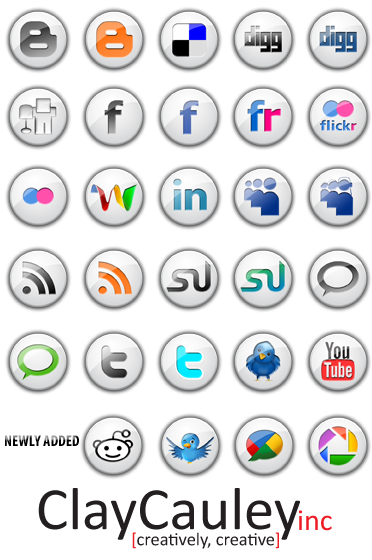 The new Twitter bird icon, Google Buzz, and Picasa icon are also in the set. The preview image now shows the new icons included. Great job on this! Awesome! foursquare, yelp, and stampt ?? This social media icons has been featured here [link] great work! Could you add a +1 button ? So useful, thank you for sharing! These are amazing! Any chance you could add a basic email icon (simple blue envelope would be great)? Hi, Great icon pack. Do you have an icon for FourSquare? Thank you! Glad you like them! If you have any requests, just let me know. can i have button for deviantart? 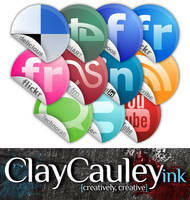 sure...email me at claycauley@claycauleyink.com and I will get right on getting it back to you!